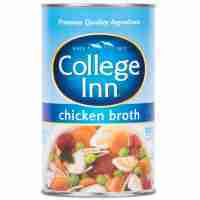 College Inn Chicken Broth offers a classic combination of flavors of plump chicken, tender veggies and just the right herbs and spices. And it's 99% fat free. Available in cans and convenient resealable cartons. Use just as much as you need and save the rest for later.